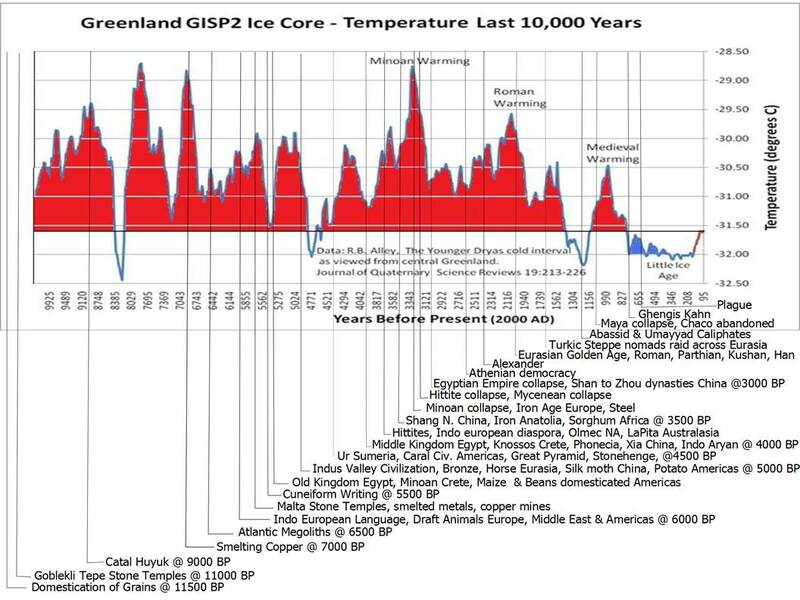 This graphic of Greenland ice core temperature based on data by Alley has been making the rounds. I took a notion to plot human history against it and don’t know who to credit for the base graphic, but grateful acknowledge it as not my own work. Unfortunately the WordPress picture lice chewed mercilessly on the image. One can interpret it many ways. There does seem to be some correlation between warmer periods and cultural flourishing, but nothing very convincing. What does stick out is the large number of cultural collapses around the “Minoan” spike. Minoan civilization collapsed on the upswing, and the Hittite, Mycenaean, Egyptian, and Shan empires on the down swing of this spike. The following graphic by Robert Rhode has been around a while, but it is a great piece of work. A typical response is to throw up one’s hands as OMG, look at the spread in these unreliable proxies, how can we know anything from these? I will argue that the proxies are perfectly good and the variation is regional. The proxies hark from regions as varied as the tropical western Pacific, Antarctica, and Greenland. An interesting aspect is the seeming convergence of all these disparate proxies to something approaching consensus about 6000 BP. I digitized them per the screenshot in order to deconstruct the regional variation and see what else may have been going on during the Minoan spike. Here is a less dramatic smoothed version of Alley’s GISP 2 smoothed as digitized from the graphic above. It is substantially similar, but now we can compare all the proxies with history. The only interesting features I see are the multiple civilization collapses around the “Minoan” spike and the “golden age” of Eurasian civilizations; Roman, Parthian, Kushan and Han around the more broad shouldered and half a degree lower “Roman” warm period. You must realize that the Greenland ice cores are by far the most flamboyant proxy. The other proxies show far subtler response to the Minoan spike. 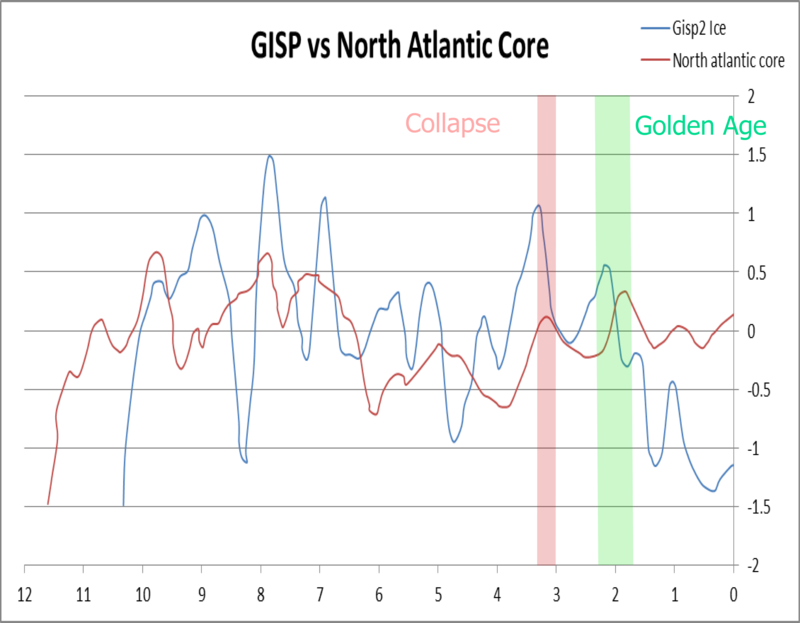 The comparison to the North Atlantic sediment core is very interesting because the ocean warming clearly led the continental ice warming. 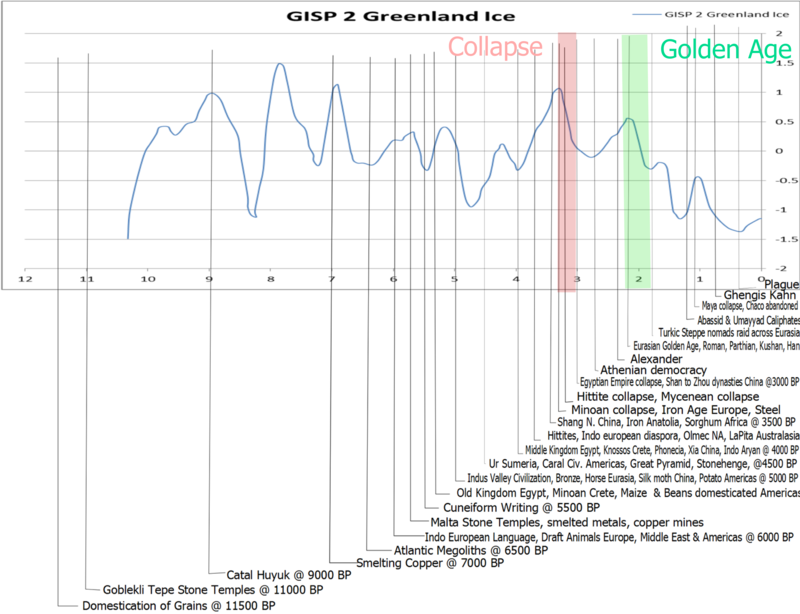 This lead progressively diminished before going anti phase with the ice during the “6kya convergence”, and then lagging the ice through a much subtler response to the Minoan and Roman warm periods. This will not be an argument that climate determines history, seemingly nothing is ever that simple. Many historians have cited Iron weapons as a cause for the multiple collapses beginning about 3300 kya, but the Hittites, who many would equate to Indo-Europeans bearing Iron and the hegemons of this trend, also collapsed during this period. When several proxies show significant spikes and multiple civilizations collapse, it is at least worth exploring. 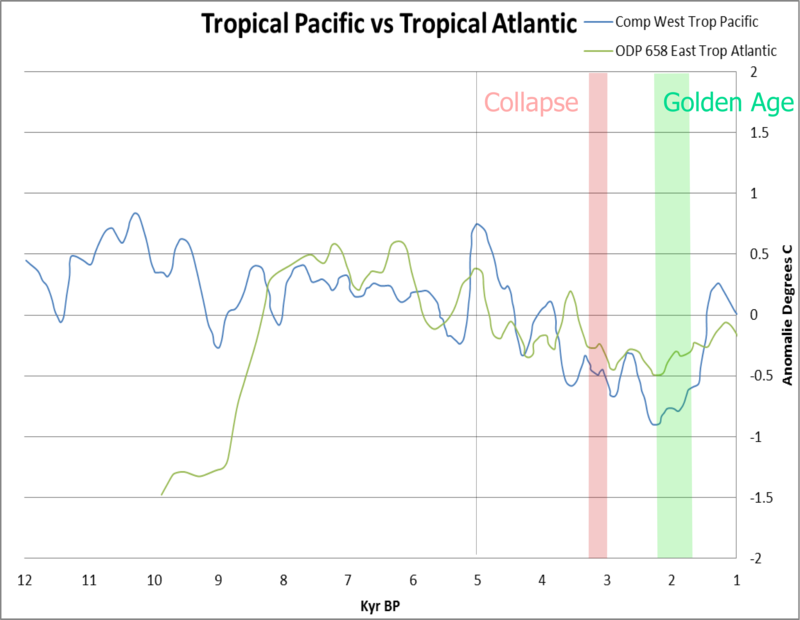 One of the more amazing results of this exercise is this which shows the western tropical Pacific was cruising along well above normal and was actually cooling as the tropical Atlantic was beginning a sharp rise out of the last glaciation. We tend to think of the oceans as vast stabilizing heat sinks, but this data belies the notion. The north Atlantic warmed like a rocket for 500 years and both tropical oceans show surprising spikey behavior. 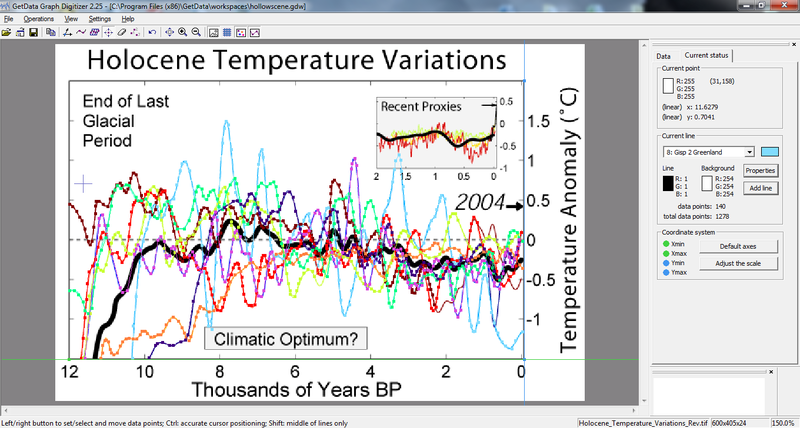 Note the one degree 5 kya spike in the Pacific. This comparison of Greenland and Antarctica is telling as the rocket ship rise out of the last glaciation began 1200 years earlier in Antarctica. 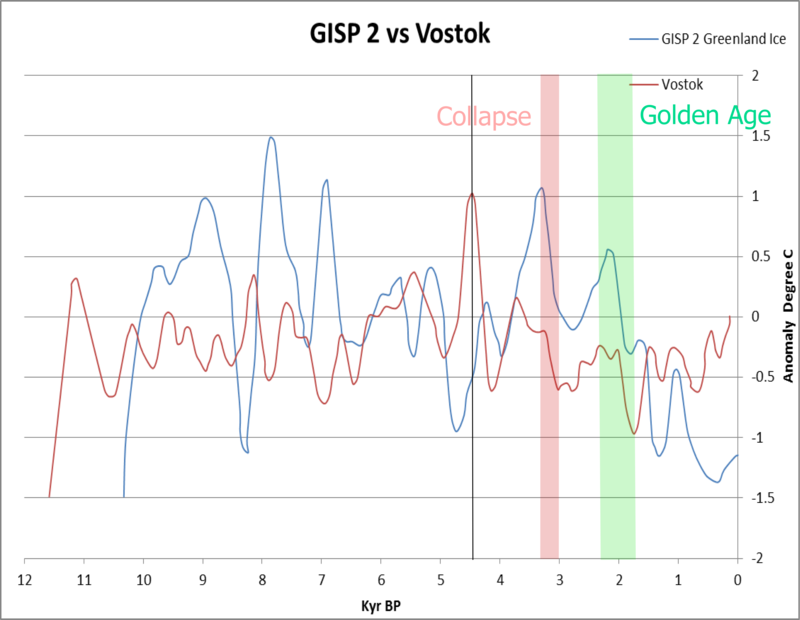 Vostok is generally less animated than Greenland but there is a prominent 1.5 degree spike 4.5 kya. 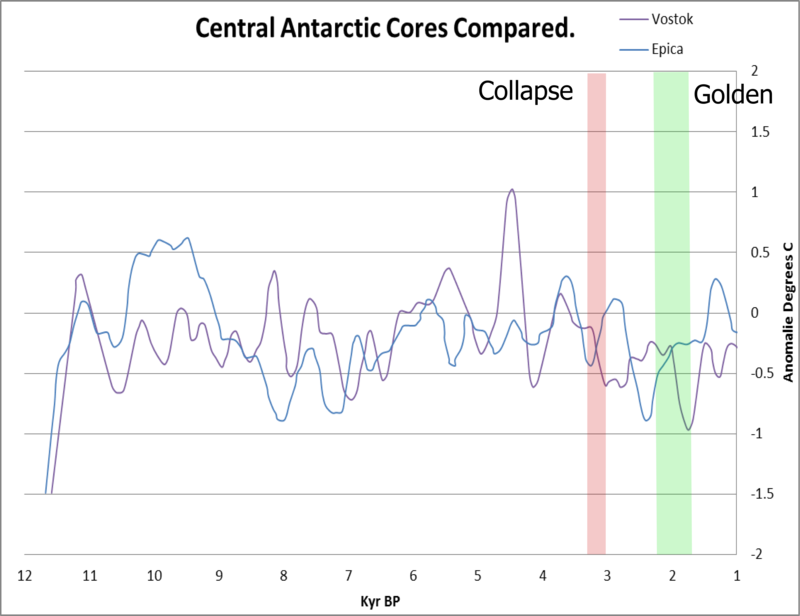 There is little reason to expect Eurasian subtropical civilizations to be affected by Antarctica, but this is included to show that the EPICA Dome C core about 500 km less central in Antarctica did not show the 4.5 kya spike. This graphic shows the three spikes, the first is in the western tropical Pacific about 5000 years ago, the second is in Vostok 4500 years ago, and the third is the Minoan. I remain convinced that all these proxies are good representations of regional differences. It is quite likely that regional spikes occasionally telegraph through time and space. 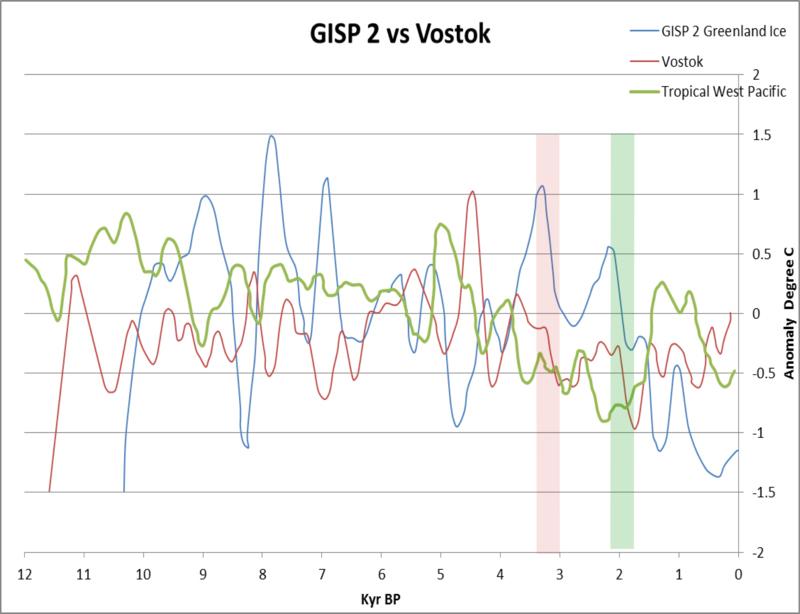 While there are several impressive Greenland spikes, the 5 kya Pacific spike and the 4.5 kya Vostok spike are definitely out of character. It may be that we need to understand signals moving as waves through the geosphere before we can truly put history on ice. This entry was posted in Climate, Climate and Civilization, Climate Change, Geography, History and tagged Proxies and Human History. Bookmark the permalink.